Coconut Macaroons a re another quick and easy, but elegant dessert. I was going to pipe melted chocolate lines across the top for an added touch, but these disappear fast. Just glad there were enough to show you a photo! I use the eggshell method to separate white from yolk. Crack the egg in the middle and gently pull it apart with an upturning and lifting motion over a small bowl to keep the yolk in one half of the eggshell. The white will pull away and slip into the small bowl. Gently pour the remnants of the egg back and forth between the two more or less equal half egg shells, being careful not to puncture the egg yolk. Pour the separated egg white into your mixing bowl before breaking another egg. If the next egg yolk does break, you will only have contaminated one white. Egg whites won’t whip if there is any egg yolk in the bowl – not important for this recipe, just a bonus tip! And yes – they do make egg separators and yes, there is one in the back of the drawer, but using it would take the challenge out of my day! You can use shredded coconut, but I prefer the smaller bits of flaked coconut. Some cooks like to mix flaked and shredded, sweetened and unsweetened – even if they did not have only a quarter cup in one bag and are substituting the other. Imagine! If your pantry is so organized and well supplied that you have two kinds of coconut at the same time, you go right ahead and open both packages at once. You know that doesn’t happen here! This time I used an oval 2 tablespoon coffee scoop to put the mixture on the baking sheet. It made a larger, flatter cookie than the ice cream scoop that also holds 2 tablespoons. The mixture will not change shape during baking, so feel free to sculpt if so inclined. Baking takes the full 15 minutes in my oven. You can reduce the temperature to 350 if the coconut begins to brown quickly , but the cookies are still wet looking and to the touch. Watch closely the last few minutes of baking. The cookies will have golden tipped coconut and a golden bottom edge when done. They will hold their shape when touched, but will feel a little damp. Cookies will firm as they cool. Light, coconut with a hint of almond, totally delicious classic macaroons. They'll become a tradition! Whisk egg whites, sugar, cornstarch, flavorings and salt together. Stir in coconut, 1 cup at a time. Using a 2 Tablespoon measure, drop batter onto parchment lined baking sheets. 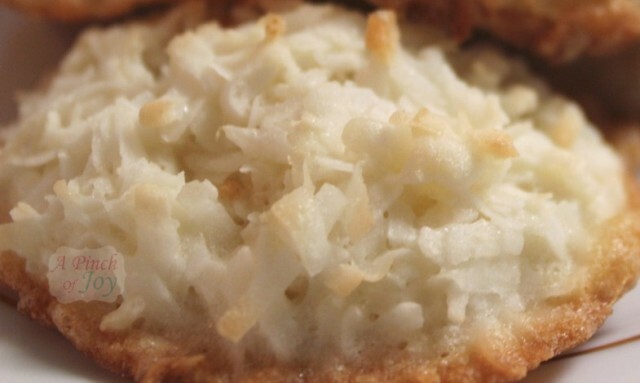 Bake 10-15 minutes until tips of coconut begin to turn golden brown. Slip parchment paper and cookies off baking sheet to counter or cooling racks. Let cool completely before removing from parchment paper. IF there are leftovers, store in tightly closed container. I love anything coconut! Macaroons are a great little treat – i like that they are low in sugar. Delicious! I use the same egg separation method and it works every time. Thanks for the great recipe. These sound so amazing. We are trying to cut down on grain, and this would be the perfect substitute for a tasty treat!!! 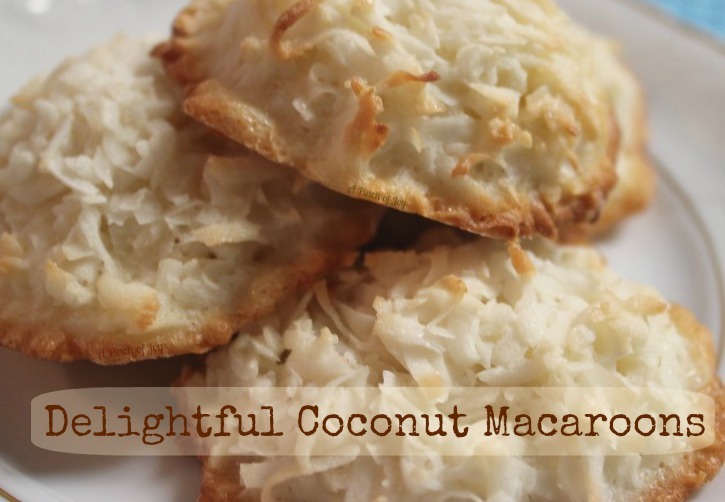 I love coconut macaroons, thanks for sharing! These are the most beautiful Macaroons that I have seen in a while. Great recipe and awesome presentation! Hope you have a fabulous week end and thank you so much for sharing with Full Plate Thursday. Hi Charlene! So glad to have you join Show & Tell today. I feel like I need lots of practice cracking an egg and separating the egg whites. I’m like you, using a tool isn’t nearly as challenging or fun. There’s so much more pride in learning the skill. The cookies sound so light and fluffy. I can almost taste them. Want to make these! Can I ask you, could I replace the almond extract with grinded almonds? I have plenty of those in the cupboard, I’d like to use them. I have no experience baking with ground almonds. If I were going to try, I think I would substitute the ground almond for the cornstarch, especially if the almonds are finely ground. I don’t know if the almonds would absorb moisture the same way as cornstarch. If almonds are coarsely ground, maybe you could use them in place of a small amount of the coconut, like say a quarter cup. I’m just guessing though . . if you try it, let us know how it worked! In the meantime, if anybody else knows, please chime in! These are my husband’s favorite cookie…I will be making these asap! I shared your wonderful macaroons on my blog today. Hugs! !